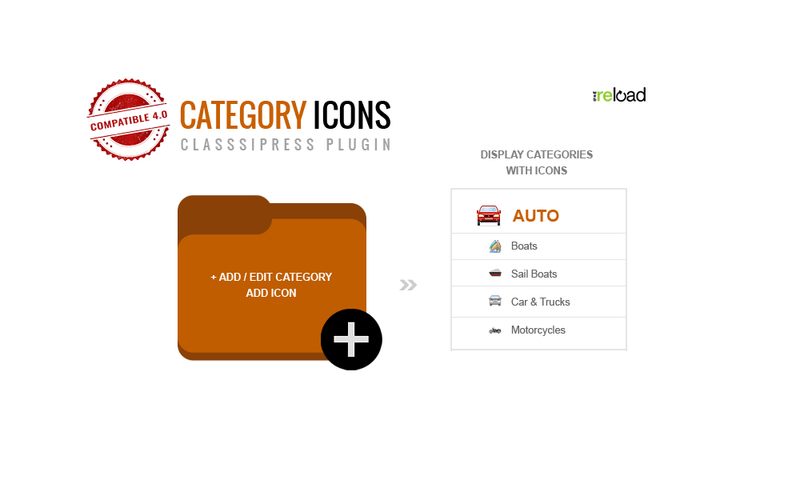 Category Icons plugin is allow to add icons to your ClassiPress categories. It will display a unique image with each of your ClassiPress categories. Everything is configurable from the settings , you can use it on your ClassiPress home page to list categories with icon, display icon front of category title on category listing page , even display sub category with icon in side bar of category listing page and display icon in an ad Categories Widget. How many sets of icons included with plugin? No there is no any icons sets included with the plugin. You need to find an image icon to use. You can get these from all over the internet and a great icon search engine is called, iconfinder.com. Extract zip file on path /wp-content/plugins/ directory. Go to wp-admin –> ClassiPress –> “Category Icons” to enable or disable category icons display for specific page. Add/Remove category icons Go to wp-admin –> Ads–> “Ad Categories” . However it is important to us to make sure that every customer is satisfied with our products. Therefore we have a dedicated Support Team helping you to solve any products-related issues in timely and efficient manner.We are also very active on twitter or facebook where you can certainly catch our attention. Before you reach us upon a problem? Read the documentation guide for your theme and plugin. Search the Support Forums for an answer. Submit a new thread inside the forums or Email Us on info@reloadweb.co.uk in case the issue requires us to connect to your site this may happen those times when we feel more individual attention to your issue may be required. When we do direct you to our Email support system, we may ask you for your login details. We don’t have exact support hours, generally we can provide feedback on any support request within 12 or 24 hours. But note, that depending on the issue complexity and our workload. If we are online and able to provide you with support during the officially “holidays” period we will certainly not ignore you. We only cover support for the Reload Web, add-ons,child themes and basic WordPress help. We cannot provide support on third-party plugins. we will try to help you with any type of requests including customization that requires only a couple lines of code changing, you must understand that we cannot provide extensive help in terms of modifications. Moreover, technical support will always take priority over modification/customization requests. If your request for modification or customization help only requires us to publish a couple lines of code, we will be glad to assist you. If however you request requires more an that amount of code to be published, we can only provide guidance OR you can hire us if you don’t have the skins to implement it yourself. It is our commitment to fix all theme bugs as quickly as possible after they are brought to our attention. We will also try provide a solution via the forum for smaller bug fixes, after which we will update the core theme or plugin. Great plugin needed for all classipress websites. I bought this plugin to make my website a bit more professional. After install I had a technical problem, but Ahmed quickly solved it for me. So, great service. Although the website is just starting and still almost emprty the result of this plugin can be seen at http://merkdealer-occasions.nl/merken-en-modellen/. The only thing I changed was the icon-size (from 30px to 36px), mainly because the icons lost detail at 30px. I don”t use icons in the sub-categories on this website (it would mean changing over 300 sub-categories) but did test it on a few, and also that looks great. In short: five stars, absolutely. This Plugin is awesome!!! I am so happy that I bought it! It is very easy to add new Icons and the site Looks so professional because of These Icons! You have said that it is compatible with ClassiPress 3.4+ and WordPress 3.4, means that it should be compatible with classipress 4.0, but it is not. I have just purchased it for classipress 4.0 but all in van, it is not compatible with classipress 4.0. Please try to upgrade it for classipress 4.0 + or refund my money back. Now It’s compatible with 4.0. How many icons does it have? The icons are available only for certain types of classified ads? Allow users to add or remove their favorite ClassiPress ads using Ajax. Show specific custom fields as tabs on an ad detail page. Captures valuable geo data from visitors on Vantage.